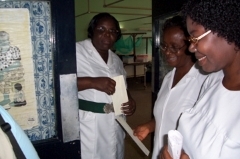 CCIM has made another trip into Korle-Bu Training Hospital, Hallelujah! God is moving by His Spirit in the "Redemption Project". 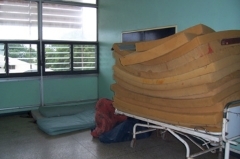 Our recent trip to Korle Bu Maternity Hospital gave us another victory. I personally believe God has used what we, as a ministry, have done to bring some real changes in the Maternity Ward Block. The team that went recently saw not one mother and baby sleeping on the floor. Some Agency had come the week before we arrived and sent all of the mothers home that had been on the floor. View our new pictures depicted below. We had several sets of twins this trip. And, we had one sad case this trip that had the team tearful. 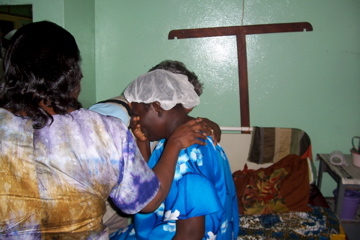 One lady had been raped and the man was not going to take any responsibility for his part. She was very despondent. So we paid $50 USD on her bill. The "Redemption Project" is worthy of your support. We redeemed 5 mothers this time at the cost of just over one thousand dollars about nine million cedis in their currency. Want to know more about the "Redemption Project" and how you can help, go to the Resources page and send your information to us. We will respond shortly. You can also go to our E-Store and order from our site and we get a percentage of your purchases. Thank you for all of your help. 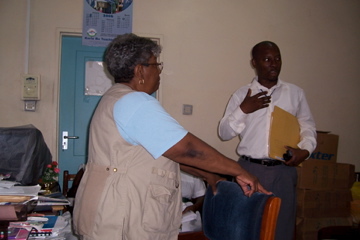 We were all happy about your visit at Korle Bu teaching hospital in October 2004. We were very delighted and great when you distributed the items for (to) us. May Almighty God bless you all. I also thank you for your faithful prayers. This is a Project that all can join in. Want to know more about the “Redemption Project” and how you can help, go to the Resources page and send your information to us. We will respond shortly. Purchase Christian books and other items through our E-store and help redeem some women and babies.